Walking on the sparkling white sand on a sunny beach in Hawaii, sounds wonderful, right? Who’d even think, the white sand on Hawaii beaches, which people love walking on, is actually something that is excreted by a certain kind of fish called the Parrot fish…at least most of it – about 70% of it is poop. Now, I suppose people walking on the beach must be all grossed out. But they shouldn’t be. It isn’t too bad after all. The sand (poop) doesn’t even smell like anything bad. It looks and feels completely fine. There’s actually no reason to be grossed out. The Parrot fish spends most of its time eating sea weed and polyps which grows on coral most of the time. When it tries to puck it off, thanks to the protruded mouth of a parrot fish, it scoops off a part of coral too. The coral and sea weed mixes and gets crushed in its throat. The sea weed and polyps eventually get digested, while the crushed coral comes out as it is. As a result, it poops out the undigested crushed coral. Interestingly, in the process of taking off a chunk of coral and munching it, the parrot fish does two good things. Firstly, it helps the coral in removing all the parasites and other things growing on it. The fish is considered to be a natural cleaner of corals. Had there been no parrot fish, corals would have died. Secondly, the parrot fish does a great service to its own beak in this process. As a result, the beaks don’t grow too much. The parrot fish eats a lot, and each one of them can produce about 100 kg of “sand” every year. It has been confirmed by scientists that about 70% of the sand that is present on all the tropical beaches has come out of the back side of a parrot fish at some point of time. Bonus fact: Our planet is old and fresh water is less. So, it’s valid to say that all the water molecules that are there now have passed through something really bad, and there’s a high chance that all of it has passed someone’s urinary tract at some point. Of course there are taller mountains than the Everest. Like if you consider the whole solar system, the tallest mountain is in Mars. It is about 2.5 times the height of Mt. Everest, and had it been on Earth, going to its peak would have required you to wear a space suit. It is about 21 km tall! Tallest means – Measuring the mountain from its base to the peak. (Which seems pretty fair to me, but it isn’t the norm). Highest means – Measuring the mountain from the sea level to the peak. Measuring sea level in turn is another complex problem because the sea isn’t at the same level everywhere. In fact, the sea level is much higher at the base of a mountain because the mountain’s mass increases the gravity and pulls the sea water making it higher there. Even if there isn’t any sea around mount Everest, the calculated sea level (higher than normal) is used as the base of the mountain. From this raised sea level to the peak, Mt. Everest measures 8,848 m.
Therefore, Mt. Everest is 8,848 meters tall, because there is no part of it which is under the sea (because there is no sea there). Also, Mt. Everest is 8,848 meters high because its peak is 8,848 meters from the calculated sea level. Mauna Kea, a dormant volcano in Hawaii, is not popularly known because it’s peak is just 4207 m above the sea level. So, it is 4,207 meters high. Mt. Everest is much higher! But the important thing to note is that a huge part of the volcano is under the sea level. In other words, its base is on the ocean bed, not on land. So, if measured from the base, it is 10,100 meters tall! That is more than 1.2 kilometres taller than the mount Everest. That means, if there were no sea, Mauna Kea would have been a clear winner. Think of it this way – Suppose you cut both the mountain at their bases and place them on a huge flat land, Kea would be 1.2 kilometers higher! Given it is not a constant, I wonder why “sea level” is used as a standard to measure heights of mountains. Clearly, Kea should be known better. School text books should at least have a mention of it. Now if you think that is all I have to say about the highest and tallest things, you are wrong. There are all sorts of complex measurements we can do. 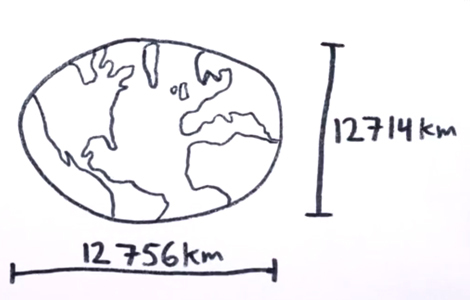 What if, you start measuring the height of a mountain from the centre of the earth? I don’t think that would be fair given the odd shape of earth – It is about 42 km farther across the equator than it is at the poles. That is too much distance to ignore. Had earth been a perfect sphere, this measurement would have made sense. Nevertheless, let’s imagine that we have started measuring the height of a mountain peak by measuring its distance from the centre of the earth. In that case, Mt. Chimborazo, an ice-capped inactive volcano and the highest mountain in Ecuador, would have been the highest one. Even with a peak which is at an elevation of 6,268 meters from the sea level, it is still the most distant place from the centre of the earth. The peak of it is 6,384 km from the centre, while that of Mt. Everest is 6,382 km from the centre of the earth. In some way, even Chimborazo is taller than Mt. Everest. Still, we’re never taught about it in schools! If there are any science teachers reading this, please tell these things to the kids. I’ll be honoured! Like crows and humans, dolphins have an impressive brain-to-body ratio. Based on an assumption, intelligence of a creature is in proportion to the size of its brain, scientific research suggests that dolphins are the most smartest creatures on the earth, after human beings. H2G2 suggests the same! They can identify themselves in a mirror-reflection, displaying highly developed, abstract thinking and self-awareness – Like Elephants and Great apes. Although self-awareness is a highly debated topic, dolphins are definitely better than so many other animals out there. To some extent, dolphins can understand numbers. They are often found to be engaged in complex play – Like, they can make and play with water bubble rings (Video – It is mesmerizing to watch them play with the rings) They are also seen riding the waves. Just like humans surf on the waves. It isn’t just that. Dolphins also live in social groups and have different names (Distinct whistles) they use to call out each other. But, why am I talking Dolphins today? A diver, Jack is seen swimming around with a couple of Manta rays in the Garden Eel cove, Hawaii. Out of some where, a Bottlenose Dolphin appears. It appears to be in trouble and then the diver notices a fishing line entangled on one of its fins. He signals the dolphin to come closer. It comes, and most amazingly it stays nearby and cooperates with the diver to let him cut the hook and the fishing line. Just two things. Kudos to the human for helping it out. The problem is solved. And cheers to the dolphin which leaves us mindblown, wondering about how intelligent animals can be! At times, even smarter than some people I’ve met.